It goes from 0 to 100 km/h under five seconds and has a top speed of over 130 km/h, and with peak torque available even at low engine speeds, it can squeal the tires with just a tap of the pedal. The only things missing here are the engine roar and the smell of gasoline in the air. FIA Electric, the New Energy Commission, and the German Motorsport Association (DMSB) presented an electric racing kart prototype—the “e-kart”—in Berlin. The FIA and DMSB rely on Bosch for this innovative powertrain system. The supplier of technology and services developed the powertrain system together with these motorsport organizing bodies, as well as with Germany’s largest kart manufacturer Mach 1 Kart. Karting is considered to be the gateway series into the world of professional motorsport. Currently, most racing karts are powered by internal-combustion engines. 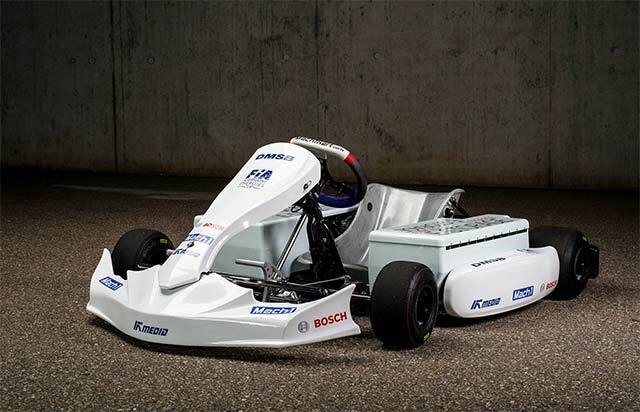 When the FIA, DMSB, Mach 1 Kart, and Bosch decided to develop an all-new electric powertrain for professional karting, they logically began with a blank sheet of paper. The idea was to create a purely electric motorsport discipline that made no compromises in power or performance. Bosch motorsport engineers came up with a solution in the form of the new BRS boost recuperation system, whose first generation will go into production at the company starting in 2017. The electrical components of the BRS support the internal-combustion motor in compact vehicles with up to 10 kW of additional power, which reduces fuel consumption and CO2 emissions by up to 15 percent on the street. It also provides the internal-combustion engine with an additional 150 newton meters of torque during acceleration. Two starter-generators delivering a total output of 20 kW form the basis of the new powertrain, which sends a sporting 300 Nm of torque to the rear axle. Energy is stored in the system using a 48-volt lithium battery. In addition, the starter-generators can recover energy during recuperation and then use it for acceleration. The nerve center of the powertrain is a custom ECU that controls energy flows throughout the kart. A set of sensors and a wiring harness complete the overall system. The new electric powertrain turns the Mach 1 Kart chassis into a clean, fast, and agile performer on the race track.